Fair to say, if someone had pulled me aside on New Year’s Eve in 2014 and said I’d take so much pride in being the ‘father’ of 70+ low flying flockers, I’d have blown bourbon out my nose laughing. And that would’ve hurt. No one is more pleasantly surprised than me by how much I love farming. And it turns out I’m darn good at it, especially when it comes to the hens. I’ve always boasted that the chicks dig me. Turns out I was right. Clarice, Maude, Yolko Ono, Heidi Plume and all the other free-range layers are living the good life, wandering freely and enjoying a pasture-forage diet. Any given day you’ll find them waddling up to the trough for treats, chilling on their swing or hanging out on their very own Ford tractor (keys not included, chickens are terrible drivers). They informed us they had selective palates when they arrived at the farm. We’ve respected their choice, so no dodgy animal by-products, origin or body-part unknown, just table scraps from our kitchen, certified non-GMO feed and, most importantly, grass and grubs from the pasture. 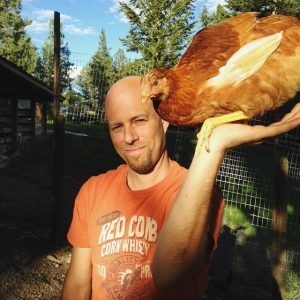 I made the call on completely avoiding hormones and antibiotics. You can’t leave that decision up to a chicken, they just don’t have the research skills to make an informed choice. The one time I caught Charlize on my laptop, she was frantically pecking “Single Hen Seeks Free Range Rooster” on a dating site. Enough said. Our ladies lay beautiful, colourful eggs with the delicious, dark golden yolks and the hard-as-nails shells you’ll only get from free-range hens. Purchase a dozen, ready-to-carry in our unique vintage carton, or jump into a pair of gumboots and follow us to the henhouse. You can meet the ladies yourself and collect your eggs right from the nest boxes. While you’re at it, ask about their progress in organizing the first ever Chicken Roller Derby League. You haven’t lived until you’ve seen hens on roller skates. 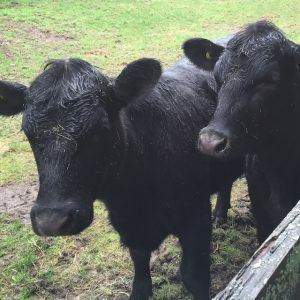 We’re easing into cattle ranching, with just two head of Black Angus/Red Angus to keep the chickens in line (we’ll see who manages who there…). 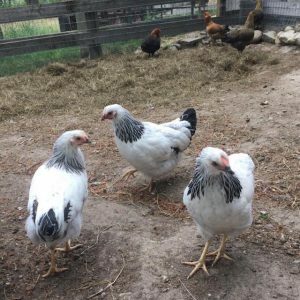 This year we are happy to take care of Bonnie and Clyde and, like the chickens, we’re raising them following organic practices.